OP2851. Der Schatzgräber (Schreker), Live Performance, 1989, Hamburg, w.Gerd Albrecht Cond. 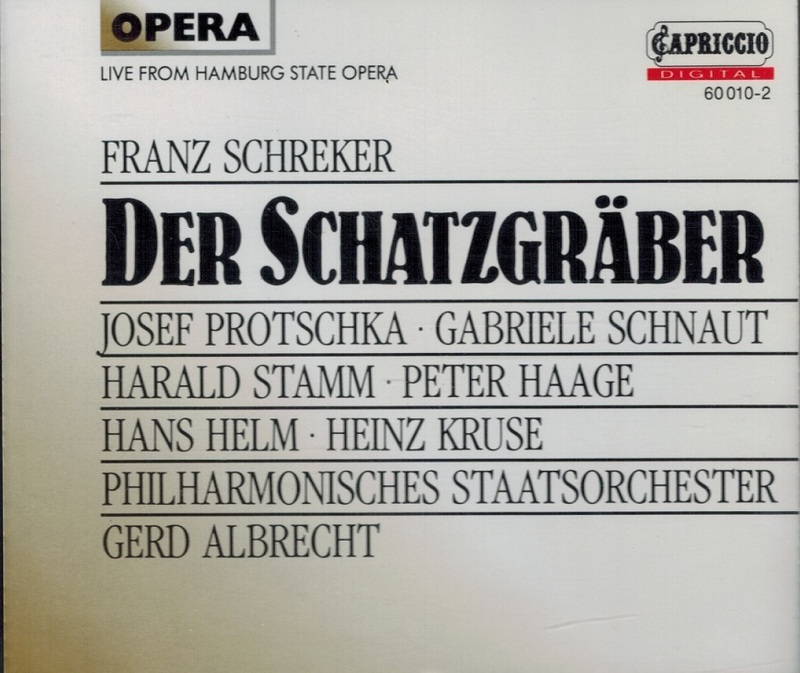 Hamburg State Opera Ensemble; Josef Protschka, Gabriele Schnaut, Harald Stamm, Peter Haage, etc. (Germany) 2-Capriccio 60010, Slipcase Edition w.90pp. Libretto-Brochure. Brilliant sound! Excellent, ever-so-slightly used copy. Long out-of-print, final copy! 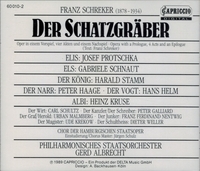 “The Austrian composer Franz Schreker made quite an impression on Germany, especially with his chief work DER SCHATZGRÄBER (The Treasure Digger) (1915 - 1918), which highlighted his strengths as the most significant musical-dramatist after Wagner. When he composed the opera's prologue, four acts, and epilogue, as a musical-dramatist would, he also drafted his own libretto. In this piece, he worked with remarkable craftsmanship, creating music that was melodically sensuous and harmonically individual, using a rich musical language that synthesized expressionism with symbolism and melodramatically combined elements of naturalism and mysticism. He utilized the rhythm of spoken language, wrote limber arioso lines, and created an exotic sensation within orchestration. Although most of his operas contain complex decorative rhythmic motifs within a beat, the leitmotif system in this work is considerable less prominent than those found in his other compositions. 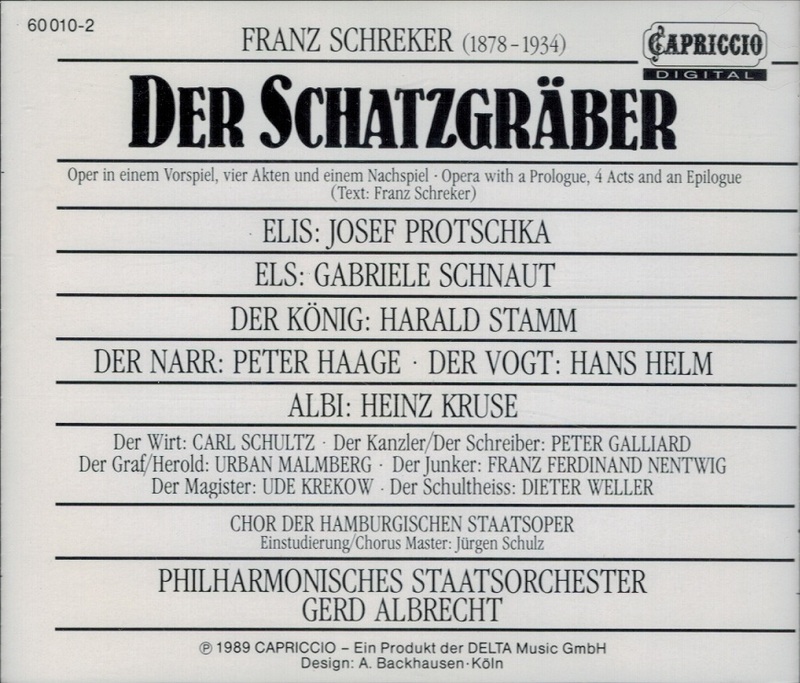 Instead, the emphasis in DER SCHATZGRÄBER shows a tendency toward more triadic harmony, with much parallelism, and a slightly less complicated texture. Set in the fairy-tale ‘Middle Ages’, the plot of this opera tells of stolen treasures, separated lovers, murder and accusation, and closes with reference to a mystical palace of dreams where the main characters can be reunited among the greatest of treasures. It was premiered in Frankfurt on 21 January, 1920; in 1923, the composer's wife, Maria Schreker, with her delicately lyrical voice, began her career as an operatic soprano when she was cast as Els, one of the lead roles.